Hotel Senator Castellana is where we stayed in Madrid for two nights. It is about half an hour to the “Centro” city center of Madrid such as Gran Via, Calle de Alcala, Plaza de Cibeles and Plaza de Espana. The hotel is located in the financial and commercial heart of Madrid so you see big buildings after just 2 mins walk from the hotel. There are also few supermarkets, restaurants and the metro located nearby. Let me show you the 3 stars hotel that we stayed for two nights in Madrid. There 5 floors with a total of 124 rooms in this hotel. I won’t say it is a very big hotel but very cozy and friendly services. There are two lifts to bring the guest up and down to the rooms and the inner lift is for their cleaner staff only. At the front lobby, there is a little kiosk selling drinks and little souvenirs. I won’t say the room is very spacious but certainly not very narrow. The facilities in the room is very basic but the room is clean and tidy. The lighting in the room is good enough for reading and there is a side table if you need to work on your laptop. The bathroom is clean and equipped with toiletries such as shampoo and body soup. A small dryer is also available. Towels are clean and hot water runs well. The little bathtub and a shower. The hotel breakfast starts from 7 am to 11 am in the cafe. There is a wide variety of healthy choice for you to choose from. I went early to shoot these pictures before the food got messed up. Start with the far left is the Spanish omelet also called tortilla de patatas, one of the popular Spanish cuisine which was made with eggs and potatoes, sometimes also with onion and garlic. Next to it are some ham and cheese. The final two rows are fruits; kiwi, grapefruits, pineapple and melon. There is also a fresh orange juice machine where you can fresh squeeze the orange juice from these oranges. Pretty fun to make but it tasted very sour. This would be the Spanish breakfast, eat with Jamon Serrano and the grated tomatoes. Toast some bread and put the Jamon Serrano and grated tomatoes on the top. Or you may want to use the olive oil to spread on your bread. Spaniard love olive oil and you see it almost in every table, just like our soya sauce. They are the second biggest consumer of olive oil after Greece. The long and thin sausage is the Spanish sausage called Longaniza, it is similar to chorizo but less spicy compared to chorizo. The churros in Spain is usually found plain version only without any other toppings such as cinnamon or chocolate. One thing interesting is Spain eat churros with thick hot chocolate for their morning breakfast, it is not a dessert. The standard bacon, egg and sausages. All pastries are freshly made from the over, still warm and crispy. My plate of breakfast consists of Jamon, Spanish sausages, grated tomatoes, churro and the fresh squeezed orange juice. The right way of eating churro in Spain is dip into hot thick cholate, not with coffee. I don’t like chocolate so dip in coffee instead. It tasted as good. Just two minutes walk to the main road, you see the streets are full of commercial buildings for offices. There is a huge Carrefour Market near the hotel. You may want to get some snacks and drinks and readily cooked bento set here. If you want some Asian food, try out the sushi corner in Carrefour here. There are seats too if you want to dine in here. All market in Spain sell the big fat pig legs – Jamon. I tried to pick one up but it is so heavy. One thing I notice after arriving in Spain is Spaniards love seafood, they have fish, shellfish & shrimps into their daily cuisine or tapas. They eat as much seafood as the Japanese people. 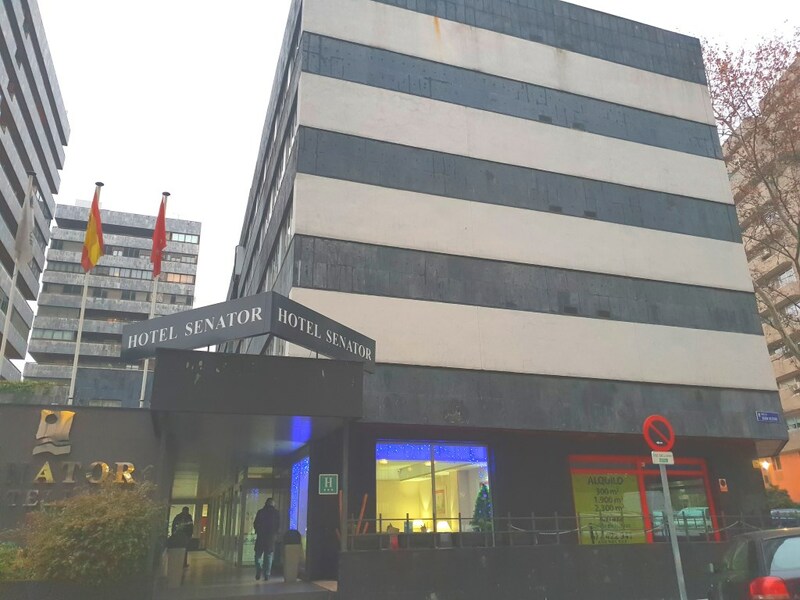 The hotel is located about 30 mins away from the city and if you don’t mind the distance, you can consider staying in Senator Castellana Madrid which is located in the business center of Madrid. It is actually located very near to the Madrid Santiago Bernabéu Stadium within 5 mins by car and 15 mins by walk. Most people stay here for business or visiting Santiago Bernabéu Stadium for the football. A huge variety of breakfast to choose from in the morning and the staffs are friendly too. Highly recommend to anyone who is watching football in the Madrid stadium as it is so near. If you are hungry, go to the nearby Carrefour market to get your ready-made food for your dinner or supper. Wow! the outside of the building was deceiving and didn’t expect the inside to look like that. The rooms seemed cozy and clean and all that food looked delicious. Probably the hotel is located in the CBD area so I guess it is just like another business building. Nothing too fancy. To me, the outside of the building looks kind of old. I was pleasantly surprised to see how modern and up to date the inside looked! It looks like you have a great time during your stay, especially with all that food! I have no complain for the breakfast in the hotel, a good spread and love their hot pastries and bread. The staffs in the hotel are really friendly too. Nice hotel. Sounds perfect for a business trip, every thing you need. Close proximity to the business district and not so far from the sights for the down time. You are right, the hotel is great for business trip as it is located in the CBD area. Half an hour far from the heart of Madrid, the Sol and other Gran Via. The price is certainly more affordable here. Just like the saying goes “don’t judge a book by it’s cover” wow that hotel surprised the heck out of me! I was looking at the outside and thinking it looks like an old hotel but the inside is gorgeous! Thanks for sharing those beautiful photographs! Haha, thanks for your cute comment. The hotel is quite reasonable if you don’t have too much expectation. The food and the service are great. The room has all the basic thing you need. It is an average hotel. Looks like a very nice place to stay. It’s nice when a hotel can offer so much and makes your stay comfortable and convenient. I guess that is most important for the tired travellers. Thanks a lot for your comment. Oh, this takes me right back to Madrid! This looks like a lovely place to stay. We had the tortilla de patatas a few different times while in Spain – quite delicious!! What a gorgeous hotel with so many amazing amentities! I hope to visit here someday! This seems like a pretty nice hotel. A sharp contrast from the outside to the inside. Love it! It is more like a business hotel which sits in the CBD area. My family and I do want to visit Madrid. Thanks for sharing your post on Senator Castellana Madrid. It gives me an idea of a good hotel to stay during our vacay. Glad to learn that you are visiting Madrid with your family. Hope you have a great time there. When I make it to Madrid one day, I know where I want to stay! Everything I want is there and the food looks delicious! The convenience is very appealing too! I like the color combination in rooms. Food looks delicious too Madrid is on my ‘too see’ list. Thanks for this wonderful review! Beautiful review. How nice it must be to visit Spain. I love the food station so it’s definitely something that I would readily visit. The food. Oh God, the food. Everything looked so yummy. I am not sure about other cultures, but as American’s vacation is all about the food. Spanish tapas are well known all over the world. I am sure you will love to have a vacation in Spain since food is your thing. Spain has so much to offer and hope you will make it there one day. I am sure you will love the food and culture there. I’ve never been to Spain, but I plan to visit this year. I have the plan to visit Madrid and Barcelona. This is a hotel I would respond to. The rooms are spacious and tidy, and the food looks great. What a lovely breakfast they offered! Sometimes there are hotels that have minimal approach to their rooms but offers a good dining experience. I want to visit Madrid soon and consider to stay at this hotel. I would absolutely love to visit Spain! This is definitely a place I’d love to stay for sure!!!! Love all the pictures. This looks like a great place to stay! Love the interior decor!